In our final recipe collection in the Theme & Variations series, we’ll play sweetly in the kitchen; calling upon a single versatile cake recipe to deliver an array of tempting treats fit for finishing a meal or rounding out a special occasion. I really hope you’ve enjoyed following along as we’ve taken the Classical form of “Theme & Variations” into the kitchen — making simple changes to recipes to create exciting new dishes. Marrying food and music — two of my most favorite things — is something of a passion of mine. To demonstrate the Classical form that inspired this series, here’s probably one of the finest examples of Theme & Variation form: Mozart’s 12 Variations in C major on Ah! vous dirai-je, Maman, K.265. 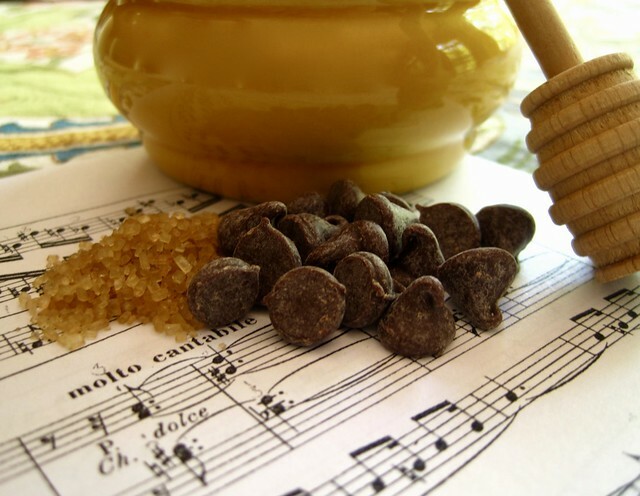 The theme you’ll immediately recognize; in America, we know this tune as “Twinkle, Twinkle, Little Star.” Listen to all the ways Mozart turned this simple tune on its ear. By the end, it’s barely recognizable! As you can see, performing a piece in Theme & Variations form — while exhilarating — can be quite demanding for a musician. Fortunately, our culinary spin on this form has been both fun and delicious for both the chef (the musician) and the tasters (the audience). In today’s final variation in our Dolce e Delizioso collection, we take one more layer of that easy-to-make butter cake and turn it into a decadent layered dessert marrying its buttery flavors with toffee and coffee to make a fancy treat that can be made into elegant individual servings or an impressive presentation in a trifle dish. 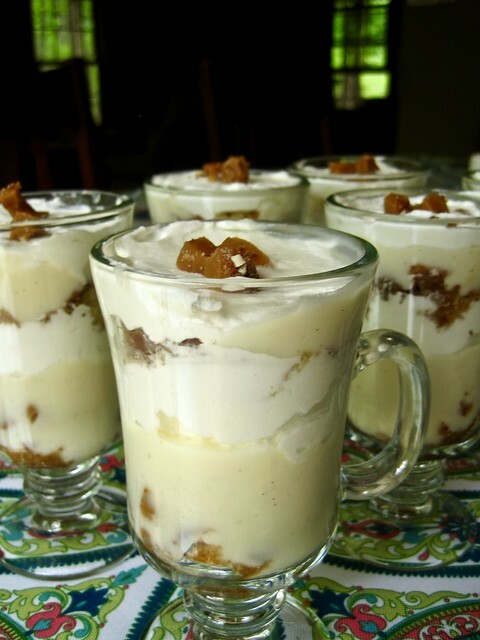 Trifles make an exciting dessert because their layered presentation and variety of textures offer a different experience in every bite. With ample chilling time, the toffee pieces maintain a bit of crunch, but yield a caramel-odius counterpoint to the coffee and buttery flavors in the rest of the dessert! To make the vanilla custard: heat the milk, sugar, and salt in a medium saucepan over medium heat. Stirring to dissolve sugar, heat until milk is scalded but not boiling. Meanwhile, in a medium bowl, whisk together the egg and corn starch until thoroughly combined. While whisking, slowly add the hot milk mixture; whisk until completely incorporated. Return entire mixture to the saucepan and heat over medium heat until thickened and just beginning to boil; remove from heat and stir in vanilla. Pour into a bowl, cover with plastic wrap placed on surface to prevent skin from forming. Allow to reach room temperature, then refrigerate 1-2 hours. To make the whipped cream: pour the cream into a medium bowl. Beat at medium speed until frothy; add confectioners’ sugar, increase speed, and whip until stiff peaks form. Cover and chill until needed. To assemble, slice cake layer into bite-size pieces. 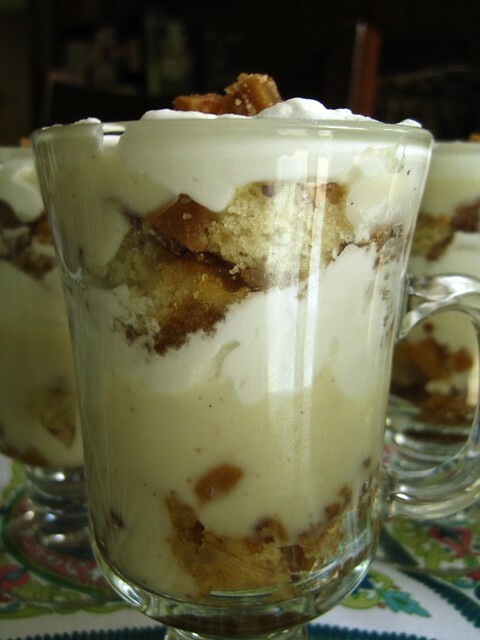 In individual containers or in a trifle dish, alternate layers of cake pieces, drizzle cake with Kahlúa, sprinkle with toffee pieces, top with vanilla custard, then whipped cream. You can make as many or as few layers as you like. Chill for about two hours before serving.